The fight against terrorism in the Middle East was the main subject of discussion between Russian Foreign Minister Sergei Lavrov and U.S. Secretary of State John Kerry in Vienna on June 30. Having exchanged "concrete opinions," the ministers decided that consolidation is needed to effectively fight the Islamic State. However, some experts say that the two countries are not prepared for this. 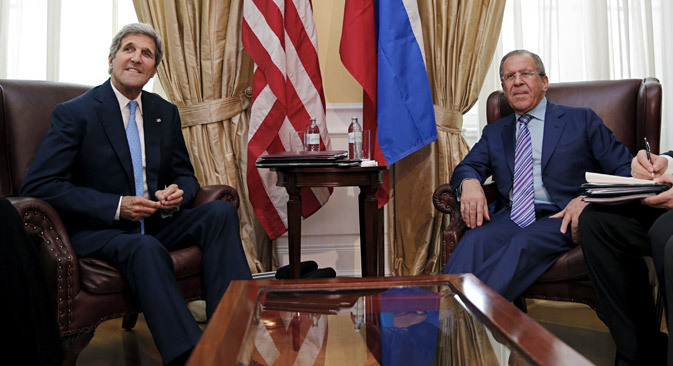 A meeting between Russian Foreign Minister Sergei Lavrov and U.S. Secretary of State John Kerry was held on Tuesday, June 30 in Vienna. The central issue of this year's fourth meeting between the ministers was counteraction to the Islamic State in the Middle East. The meeting had been organized by the leaders of Russia and the U.S., and as Lavrov had said earlier, its objective would be to exchange opinions on how "to unite the efforts of our two countries and other countries in the region more effectively" in the fight against Islamic State extremists. Lavrov had also stated that in Vienna the Russian side intended to avoid rhetorical questions and be concrete and "push for joint practical actions." One of the proposals that the Russian Minister had expressed prior to the talks was the creation of a coalition composed of regional and non-regional players. After more than two hours of talks, the exchange of "concrete opinions" had taken place, said Lavrov. Kerry agreed that "the situation in the region requires more active measures.” As had been expected, both ministers discussed ways of consolidating "all those who believe that ISIS is an absolute evil" and agreed to stop using questionable militant groups for tactical purposes. However, it is not clear which "concrete" measures were agreed on. But in the view of Vitaly Naumkin, the director of the Middle East Institute at the Russian Academy of Sciences, the fact alone that the Russian and American presidents are sending their foreign ministers to talk about the issue is "a step forward." Other analysts interviewed by RBTH do not believe in the coalition. The coalition already exists - it is the U.S. and its satellites, and it is not working, says Alexei Mukhin, a political analyst and the general director of the independent Center for Political Information. "On the contrary, experts are noticing that it was the coalition's actions that had led to the expansion of ISIS's control over various territories," Mukhin said.